At the meeting of the Pecos, Devils, and Rio Grande rivers is the Amistad National Recreation Area, a long, winding national park that runs the length of the Amistad Reservoir north of Del Rio,Texas. 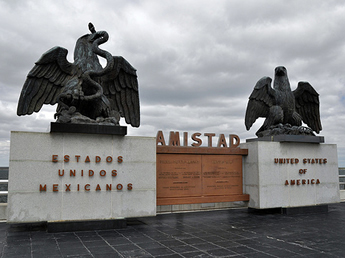 The United States and Mexico share the reservoir, and its name reflects this partnership: in Spanish, “Amistad” means “friendship.” The reservoir is the result of a project of the bi-national International Boundary and Water Commission in the 1960s, and both countries manage the reservoir today. Southeast of the recreation area, Americans and Mexicans in Del Rio and Ciudad Acuña celebrate their shared history, culture, and reservoir every year in Fiesta de La Amistad – the Festival of Friendship. The Amistad National Recreation Area preserves the environments of the reservoir’s north and east banks, and maintains public facilities for outdoor activities. In the Amistad basin, Europeans are a relatively recent addition to the cultural landscape. Evidence of pre-Columbian American Indian groups in Val Verde County dates back more than 10,000 years, and ancient pictographs, some 6,000 years old, decorate the county’s remote caves and canyons. The earliest record of Europeans in the area is of a 1590 colonial expedition. In that year, Portuguese immigrant Gaspar Castaño de Sosa trekked through the Amistad Basin on his way to New Mexico, where he hoped to found a private mining colony. In 1635, Spanish Franciscans established the short-lived San Felipe del Rio mission, but the missionaries abandoned it after an Apache raid destroyed their outpost. Permanent European settlement did not come to the Amistad border region until Mexicans and Americans founded their respective border towns in the late-19th century. The Rio Grande River (called Río Bravo in Mexico) became the international boundary between Texas and Mexico in 1848, at the end of the Mexican-American War. After Texas became part of the United States in 1845, the two nations fought to determine the border between Texas and Mexico with the United States claiming that after its annexation of Texas, the U.S.-Mexican border was at the Rio Grande. The Mexicans maintained the boundary was farther north at the Nueces River. After they pushed the Mexican forces south, the Americans invaded Mexico City. When the war ended, the two nations agreed to the terms of the Treaty of Guadalupe Hidalgo, which established the Rio Grande as the international boundary and gave half of Mexico’s northern territory to the United States. Between the 1850s and ‘80s, the U.S. army occupied the Amistad Basin area to maintain the San Antonio-El Paso Road, an east-west route used by mule-powered wagon trains. The road ran through the river area and was part of the well-traveled transcontinental route from the Gulf of Mexico to California. The road fell out of favor in the early 1880s when the Southern Pacific Railroad Company completed the first southern transcontinental railroad along the same route in 1883. This railroad ran through the Amistad Basin, and remains of the old railway, including tunnels, are still visible on private lands around the Amistad National Recreation Area. Permanent settlement followed the railroad, as so often happened in the history of the American West. In 1885, Texas established Val Verde County to administer to the river region’s growing population, and Del Rio, a small town by the railroad, became the county seat. Mexican settlers founded Ciudad Acuña in Coahuila, Mexico in 1877, and the parallel sister towns expanded together as opposite ports of entry along the Rio Grande. After a storm flooded Ciudad Acuña in 1954, the United States and Mexico agreed to build a reservoir and dam at the confluence of the Pecos, Devils, and Rio Grande rivers. In October 1960, American President Dwight Eisenhower and Mexican President Adolfo López Mateos met in Ciudad Acuña, where they agreed to a river-damming project. 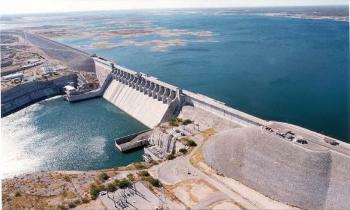 The Amistad Dam, which created the Amistad Reservoir, was a joint-effort by the two nations completed nine years after the meeting in Ciudad Acuña. The dam is six miles long, 254 ft. tall, and dams the reservoir of roughly 65,000 square miles. 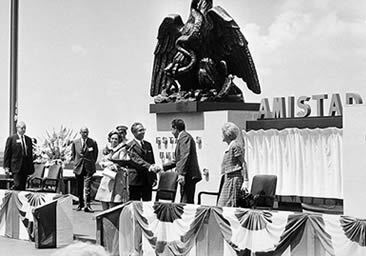 Presidents Richard M. Nixon and Gustavo Díaz Ordaz dedicated the bridge together in 1969. The International Boundary and Water Commission oversaw the project. 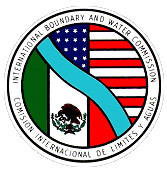 Founded in 1889 as the International Boundary Commission, the commission since 1944 is an international body that manages the execution and terms of border and water treaties between the United States and Mexico. The commission includes a Mexican Section and a United States Section, each funded by their own governments and led by their own commission engineer, who holds official diplomatic status in Mexico or the U.S. The 1944 treaty that created the modern commission outlined how the two nations should work together to manage the flow of the Rio Grande, which they did when the Amistad Dam was completed. They continue to share responsibilities in its ongoing operation. Every year, the American and Mexican residents of Del Rio and Ciudad Acuña throw a weeklong festival to celebrate their borderland heritage and the life-giving water they share. The sister towns sponsor this Fiesta de la Amistad, a celebration of friendship, which is held in October to commemorate the 1960 meeting between Eisenhower and Lopez-Mateos. During the fiesta, the mayors of Del Rio and Ciudad Acuña make speeches and the communities hold parades and an arts and crafts festival. This international celebration grew out of the cities’ Good Neighbor Day, first observed in 1956, and the Miss Del Rio Parade, which began in 1934. Now an important part of Fiesta de la Amistad, Miss Del Rio is the only parade in the world known to begin in one country and end in another. Del Rio also celebrates the Mexican holidays of Cinco de Mayo and Mexican Independence Day (September 16). Amistad National Recreation Area is located about 10 miles north of Del Rio on highway US-90. The recreation area offers public spaces for fishing, camping, hiking, bird watching, and boating. Visitors can hike or boat to discover Lower Pecos River culture pictographs on the recreation area land or in nearby Seminole Canyon State Park. The State park offers guided tours of its caves. In Del Rio, attractions include the Whitehead Memorial and Laughlin Heritage Foundation museums, the Val Verde Winery, Del Rio Council for the Arts, and the San Filipe Golf Course. Two Ports of Entry between Mexico and the United States are near the recreation area: the Lake Amistad Dam International Crossing and Del Río-Ciudad Acuña International Bridge. The six-lane international bridge that connects the cities directly on highway US-277 is where the parade crosses over. The other option is the two-lane dam crossing, which runs along State highway 349, over the six-mile long Amistad Dam, where the Rio Grande exits the reservoir and continues its journey south to the Gulf of Mexico. On the dam bridge is a border marker and memorial to the nations’ amistad. Twin bronze eagles flank the marker: the golden eagle of Mexico and the bald eagle of the United States. Amistad National Recreation Area is a unit of the National Park System located at the Amistad Reservoir in Del Rio, TX. The visitor center for the Amistad National Recreation Area, a unit of the National Park System, is located at 9685 Highway 90 West, Del Rio. Amistad Visitor Information Center is open daily from 8:00am to 5:00pm, except on December 25. For more information, visit the National Park Service Amistad National Recreation Area website or call 830-775-7491. Motorists must go through standard Port of Entry procedures to cross the border between the United States and Mexico. Visit the U.S. Customs and Border Patrol Del Rio/Amistad Dam webpage for more information.